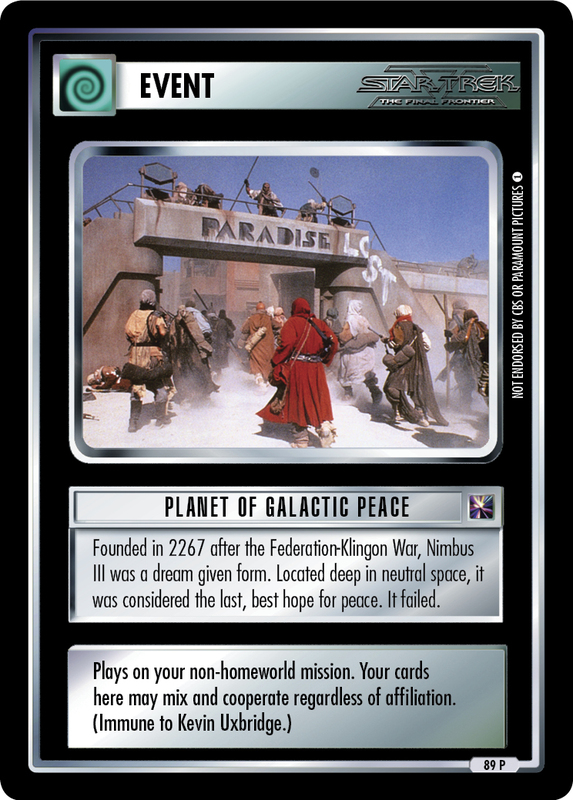 Today's spoiler, Planet of Galactic Peace, started out as a card in Live Long and Prosper. I'm not sure how it came up, but we really liked the idea of a card that would eliminate the special rule for Diplomatic Conference. We wrote one up, got tentative approval from rules and errata, and put it into the file. Everyone loved it, but the card was eventually cut for space. At the same time, a card that was originally in this file got taken by another project, leaving a hole. I decided to snap up the card and it ended up here. I'm told that in that time, there's been some disagreement between design, rules, and errata about if this card is going to do the job of replacing the rule for Diplomatic Conference. It might need to be handled differently, so for now, that's not yet a thing. But we'll just pretend that it doesn't exist and that you need today's card to make that mission work. Speaking of today's card, it's pretty simple: at a single, non-homeworld location, your cards can mix and cooperate. It's an all-way treaty for a single location. Which got me thinking about what kind of deck could use such a thing... Diplomatic Conference, obviously... but what else? What other kind of deck wants people from a lot of different affiliations? Well, that brings me to today's deck skeleton. It's a deck I've been putzing around with for about a year based on the idea of solving The Discovery of Sha Ka Ree for as many points as possible. Maybe I could combine those two ideas into a two mission, all-planet deck that aimed to complete Diplomatic Conference and The Discovery of Sha Ka Ree for 140 points. So that's the deck idea I'm bringing to you: Rainbow Brite and the Face of G**. The deck starts out with four missions you need: Khitomer Research, Diplomatic Conference, Sha Ka Ree, and a mission for your Ferengi Trading Post. I went with a space mission, just to hedge my bets (and give me an easier path to winning if the two planets prove too difficult.) Camp Khitomer lets you get some free plays in, and helps you get Sybok and his cronies out more quickly. Assign Mission Specialists brings two to your outpost, where it just so happens everyone can mix. This lets you start playing Going to the Top right away (once on your turn, once on your opponent's turn) to get seven (7) different affiliations worth of V.I.P.-classification personnel with Leadership x2. Draw engines are all card plays, so you can get your card drawing done ahead of the end of turn. This lets you use the original Q's Tent to download specific cards that are very useful, at the cost of no further drawing those turns. Aside from this, you'll want to play people and shuffle them around as best you can. Play copies of Planet of Galactic Peace (PGoP) along your spaceline so that you have safe havens where your ship can stop without all kinds of house arrest situations. Hopefully, Sybok comes out early and can start playing Release This Pain on your V.I.P.s so that you don't need as many copies of PoGP in play to get going. It's weird, and it's probably awful, but man was it fun to put together. I'm absolutely going to finish this deck and play it sometime soon. In the mean time, let me know what you think of the skeleton and the ideas here. If you use this as an inspiration for your own deck, please post it! We can't wait to see what you guys do with these cards, and if you like these little jumping off points, so let us know! And I hereby issue an order for you to come back tomorrow for another preview card and another quick start deck.